In the not so distant future, to cope with the traffic jams and verticalization due to the increased population, the city of Tokyo was reconstructed under the theme of city sharing in which people share the urbane space by transforming the roads and city structure by time of the day. A woman named Nico is walking in the city. She is having her long-awaited day off; however, she does not know what to do and who to hang out with. She hopes an exciting thing suddenly happens. Then, a truck passes right before her eyes. The loud music and flashy decoration of the vehicle reminds Nico the car it that everyone's talking about on the internet. As soon as Nico sees it, she runs after it, then runs into Gatsu and Makito. Nico gets in their latest A-Class and they chase after the truck driving through the city that is changing its form rapidly. Imagine my surprise when I saw an article on a short ONA made by Productions IG when I was browsing through a car blog. Seeing that a German company which used to only specialize in executive/expensive automobiles that used to only target customers in their 40s with a hefty salary, this commercial comes off to me as quite revolutionary as a car enthusiast/business student and awesome as an anime fan. This was not the first time I've seen that anime has been used as a medium as advertising. This however was the first for a non-Japanese firm, and in terms of quality, the small details in a 6 minutes short really shows. I'd give credit to those who convinced the uptight Germans in Stuttgart to put funding into this. Given it's 6 minutes running length, there isn't any particular story to speak of. It does play parody to the most famous Japanese car-related anime, so I will give credit for that. The futuristic look of the 'moving city' with the lighting, the details of the characters are surprisingly good for such a short clip. The integrating of the A class (possibility A45 AMG?) with the 'Blue Wonder' noodle truck is done greatly. Water effects and lighting are used in great effect. Nothing much to say here, but each are distinctive and fits well to the 'futuristic japan' theme that is going to play here. What part of seeing a prototype/futuristic A45 AMG racing against a 1954 Blue Wonder truck fitted with a 6.2 M159 V8 lifted from a gull-wing SLS AMG in a moving city, drifting in narrow Japanese streets and getting air-time in the process just to get Ramen not sound cool? At the end of the day, this is still a manufacturer promotion campaign. For the already downward trend of Japan's auto industry, the indication to the manufacturers of this clip is showing that MB is now targeting the next generation of youngsters to drive European cars. Better start making more desirable cars, Honda and Toyota. To the part anime-fan and part car-enthusiast like me out there who gets chills down his spine hearing a AMG V8 starting up, this is a really delicious, if a bit short, treat from MB of Japan. Next A-Class is a fun and short anime. Kids driving a super A-class Mercedes-Benz goes on a high-speed chase to catch the legendary noodle stand. Best part got to be when the kids can shift seats in the car without moving. 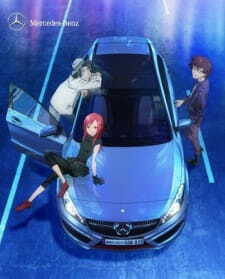 Mercedes-Benz is started to making anime hahahah..
Hmm driving through the city in Mercedes-Benz Car that's all for the story. Companies started using anime for selling cars Yeah!!! The sound design is also quite competent, with blood-pumping rock playing in the background and sound effects that fit the mood more than anything, with wheels screeching and the characters temporarily losing their minds as they attempt to catch up with this legendary Ramen Noodle truck. Speaking of the characters, of which there are mainly three of, while their development is obviously near nonexistent, they have a rather distinct amount of qualities going for them. For one, their designs are incredibly unique and memorable, most likely as a result of the fantastic art direction. Their dialogue is also just punchy enough to make them feel like actual human beings, with some fundamental personality built earlier on so you care about the adventure they experience. It can be difficult to relate to them, as I certainly don't think any normal person would risk their lives over some ramen stand no matter how damn good those noodles are. But since it's Next A-Class, it can do whatever it wants because being realistic is the least of its worries, animation aside. Overall, this was an entertaining time, no alcohol required. For how blisteringly fast it goes by, Next A-Class has phenomenal rewatch value and some seriously unparalleled artwork. If you have six minutes of your life to spare and feel like watching a Mercedes-Benz high-tailing the legendary Ramen Noodle truck, then I'd suggest you go for broke and give it a shot. It can be easily found on the official Mercedes-Benz Japan YouTube channel with subtitles, so I'd suggest one to start there.